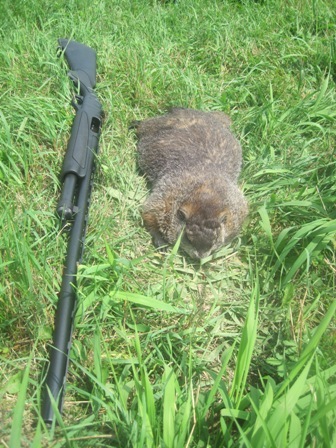 The groundhog numbers this summer at the farm have almost been non-existent with only two harvests recorded so far. Last year I harvested close to eleven groundhogs and I know that this has had an impact on the overall population in the area; also if we take into consideration disease during hibernation when the parasites attach themselves to the groundhog before they go into their dens for the winter months or if the animal hasn’t stored enough fat it starves. On my property alone, I removed five and now the only young single groundhog from this spring, is very cautious and only comes out to eat in short periods of time and also later in the evening which is not usual behavior. If he was part of last years family, then there is a possibility that similarly to crows their awareness of danger is passed down through the genes and learned in the field no pun intended. So, when I got to the farm and started to still-hunt, my skills would have to aid me in my search of the groundhogs. They were no longer in the open at their ordinary times taking in sun rays. Neither were they found near their dens but instead they were using the tree line and rock formations just meters inside the forest to use as cover. I started my way into the western field but had to wait until the cattle crossed over to the south before I could push further west. I then worked my way southeast and parallel to edge of the woods. It was extremely hot and my sweat was dripping off my forehead like a tap, drinking was so important but also taking breaks. The bugs were also harassing me and my hat came in very handy, not only against the sun. I finally reached the far side of the field and found the rock formation stone cold with no groundhog in site. I scanned the edge of the woods and this is when my eyes caught some movement up near the base of a tree. It was lightning quick, I froze in my spot and waited for more movement, if groundhogs are alerted, they will whistle then run and hide either in deep brush to find and escape hole or dart directly for the den but they will come back out if they think that the danger is no longer present. Normally, in small steps and they might even thump their paws and let out sharp whistles, almost like there are provoking the potential danger in order to get a reaction as well as alerting others. So, I waited patiently and sure enough he came out from hiding but this time he was in the high ground on my left or south. He was moving in an out of the grass and disappearing momentarily in the dark green vegetation, even though he was visible, he was not in a safe shooting position because of the large rocks behind him and a barn on the right. I chose to wait and this is when the groundhog jumped up on a log and ran along it in short bursts, stopping to check for danger, his nostrils were moving very quickly. I did not move an inch, I waited for him to move further along the log to the east and then I swung around at the same time then got into perfect alignment with his vitals with a well-chosen back stop of solid dirt. He was indeed the log runner, I took my rifle off safe, fired and released a single shot, it was my third harvest and one varmint less for the farmer. A flock of Red-winged blackbirds and a few European starlings were chanting and flying around from tree top to tree top, through the pine and cedar woods to the north. Then following a strong breeze that blew in from the west, they would fly over to the nearest barn, as if they were being scooped up by the wind. You could hear their claws gripping the aluminum sheets on the roof as they slipped down its side. And then down they went to the lower brush to the east changing direction in flight with incredible agility allowing them to land directly where there was grain spread out on the muddy ground. It was a beautiful day out in the country and the temperature was at about sixteen degrees Celsius with a strong breeze coming in from the west bringing along with it some dark grey clouds, that would momentarily hide the sun. Once the clouds had passed you could feel the heat on your face again, the sky then had a light blue color to it. The change of colors in the fields as the clouds cleared was stunning with the sun breaking through and this is a very important time to try and spot game. On the drive in to the farm, I had noticed quite a few groundhogs all along the highway on the earth mounds on each side of the road and in and around the barns scattered over the countryside. I knew that the “Siffleuse” were active. In Quebec groundhogs are also known as the “Marmotte Siffleuse” because it stomps its feet and whistles if you get too close or when danger lurks. After having spent the most part of an hour talking to the farmer about the local news over a nice hot cup of coffee, I decided to sight in my rifle scope taking a few shots into a safe shooting pit using a target that I built using Styrofoam. Using a modified sighting technique similar to that which Stephen Archer demonstrates on his Internet instructional video. Now that my grouping was nice and tight, I was ready for the days hunt. The fact that there was no varmint activity beside the cluster of barns to the east, made me change my plan and move toward the larger field to the west staying close to the northern tree line. The farm consisted of a total of six barns and the network of holes all around them including the very large rock pile to the east had seen no groundhog activity for the past few weeks. So I set off and was still-hunting for about thirty minutes to the west, until I came up to the wired fence, so I unloaded my rifle, jumped over the small creek and then got down on one knee and lifted the wire with my left hand and pushed my unloaded rifle under the fence and then using my right hand I pushed myself underneath the wire to the other side making myself as low as could. On the other side of the fence there was dark mixed forest vegetation in the shape of an island between the east and west fields. Immediately to my front was one of the largest hay fields split in two by a ravine and at its top there were clusters of rocks with a network of groundhog holes where I had harvested some varmint last summer. I also remember seeing some groundhogs hidden on the tree line on the other side of the field toward the south. So, once I made it past the wired fence and stood up in a standing position, I started to still-hunt across the field, loaded my rifle and placed it on safe. About half way across the field I noticed the groundhog sun-bathing on one of the largest rocks on the south side of the tree line. He was looking right at me and had a great field of view to the north. So, I crouched down and moved across the field in the low ground. At this point I was almost kneeling and it was hard work making it across the field without my head and shoulders going over the crest. I was studying the trees to see which one had the widest trunk, so that I could use it to close in. I found a tree just wide enough to conceal me from the groundhog and I was able to close the gap between us. I would stop quite frequently get down and move slightly to my right towards the west as I was now heading south and I could still see the varmint sun-bathing on the large boulder just inside the tree line. Once I reached part of the distance for my shot and was just meters from the cluster of rocks, I placed my left hand on the damp ground and moved forward some more than placed the rifle stock using my right hand onto the ground ensuring my movement was stealthy. I then moved into the prone position and started inching forward using the leopard crawl, placing myself in the perfect shooting position. My heart was racing for several minutes now and I was practically out of breath from all the movement across the field, meanwhile the whole time I was also watching out for the cattle herd and its large bull just over the crest of the ravine. Now in position behind the rocks on the edge of the forest only twenty-one yards out with my T-Bolt stock and barrel facing the large boulder in the south. Even though I was in position, it did not feel quite right and I had to reposition myself without setting off the groundhog into a whistling alarm causing him to retreat into his den. So, I moved back inching myself backward using my entire body, I was practically slithering almost lifting myself off the ground using my forearms and the ball of my feet and then moving myself forward back into what I thought was the best shooting prone position. I started to take my deep breaths and hold my breathing for a few seconds and then release and then breathing in again, this way I was controlling my chest movements. I did this three more times and on the third breath I released half of the air and steadied the Browning T-Bolt like a solid rock. Once I reconfirmed my cross hairs were perfectly lined up with the groundhog’s vitals, I slowly released the trigger with the tip of my finger and the shot rang out “Snap” then I heard the thump and the varmint tumbled off the boulder near its den entrance. This was the first groundhog harvest of the season, within minutes of returning to the barn to show the farmer my harvest, all the cattle started moving toward the boulders and rock formation and soon the entire herd filled the western hay-field. I know that cattle are naturally curious animals but I have never fully understood why the cows always come over to the spot where I just harvested my groundhogs as long as there is no obstacle preventing them from doing so. It was a great day to be a Varminter indeed! There we were in mid-afternoon driving up the middle of the dirt road heading north on our way up to the small lake located about half a kilometer north-west of the property. The land owner had told us that there were a few hundred Canada geese at the lake and we wanted to check it out and confirm where the flyway passed over head in order to prepare ourselves for the upcoming migratory bird season. The Canada goose season for farmlands in our area had officially opened on the sixth of the month but all the fields were located on the south side of the farm and we did not see any geese for the most part of the day. We had spotted a large flock several weeks prior during the making of the woodchuck hunting documentary. They had left the safety of the water and flew right over us heading to a field to the east, which happened to be private land and out-of-bounds. We knew we would be able to come back on the twenty-fifth of September and start migratory bird hunting on lakes and the river soon enough. On our way up, I stopped the car near the famous northern hay-field where the second most challenging woodchuck of the season and his “Condo” the tractor barn was located. 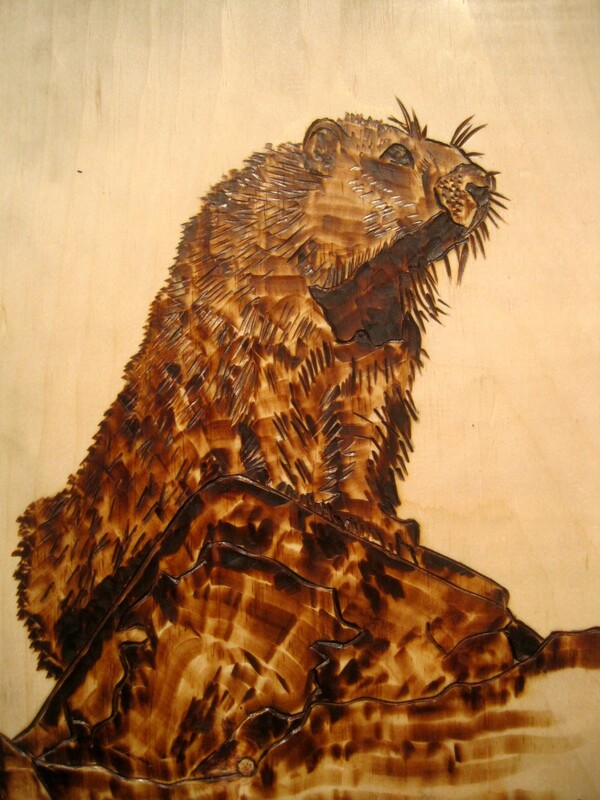 This was the woodchuck I attempted the harvest weeks earlier during the filming of the woodchuck hunt and I missed my opportunity with him due to several factors but ended up harvesting another on the southern ridge. While we were both sitting in our car seats, I could have sworn I saw a woodchuck come out from the south-western side of the barn to our right. It had been another warm day and the woodchucks were all finally coming out around five thirty in the afternoon and I was sure I was right; I did see a groundhog but he was not near the barn. He was on the south-eastern side at the edge of the field and it was my tracking partner with his excellent sight that confirmed there was a woodchuck but not where I was looking and it took me just shy of three minutes to spot him but only after I managed to get our binoculars out of the trunk. He had quite an appetite and I had a lot of open ground to cover between him and I, so we drove up to the lake and then came back on foot and then I cut through the tree line from the north and this is where I began my stalk. This did not involve me getting down on my hands and knees or even crawling and a shot from a distance was out of the question. I simply moved forward a few steps and froze, once he stood up to look around between every feeding break, I froze then moved a little closer closing the gap between me and the woodchuck. He was not just any woodchuck he was the second most challenging woodchuck hunt this year. I got within twenty-one yards, took off my safety and fired. 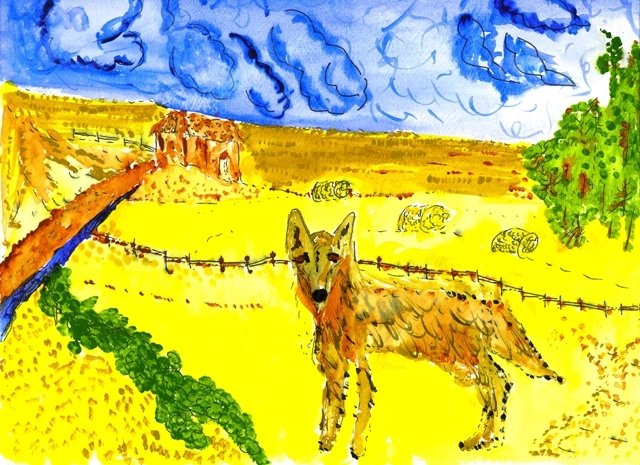 Once the dust settled the field fell silent and I had harvested the “Condo King” all thanks to the eyes of the jackal.